Congratulations! You've won the election and taken your oath. You wake up on your first day in the White Housenow what do you do? Where's the bathroom? How do you get breakfast? What time is your first meeting? When can you use Air Force One? Can you order a pizza from the Oval Office? What line do you use for personal phone calls? This fully illustrated, how-to, hands-on handbook explains the nuts and bolts of being the President of the United States. 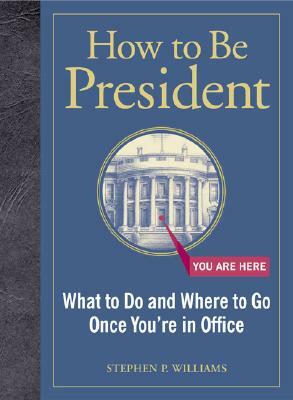 Discover how to read a teleprompter, greet foreign dignitaries, and light the White House Christmas tree. Learn where to sit at Cabinet meetings and whether you need to bring your own ball to the White House bowling alley. Your job benefits, vacation schedule, and all the other perks and duties are clearly explained in this indispensable manual. It's a tough job, and somebody's got to do it. Stephen P. Williams has written for the New York Times, Newsweek, and Martha Stewart Living. He lives in New York City.